GULLY BOY is the story of a timid slum dweller whose life changes thanks to his talent. Murad (Ranveer Singh) is a college student who lives in a slum in Mumbai’s Dharavi. He’s in a relationship with the fiery Safeena (Alia Bhatt), a medical student who comes from an orthodox upper caste Muslim family. There’s tension in Murad’s house as his father Shakir (Vijay Raaz) gets a second wife, much to the dismay of his mother Razia (Amruta Subhash). Meanwhile, one day an upcoming rapper MC Sher (Siddhant Chaturvedi) performs in Murad's college and he gets floored. After all, he’s always been interested in rapping. MC Sher one day asks aspiring performers to meet him and Murad jumps at this opportunity. MC Sher takes a liking for Murad and motivates him to rap publicly. Murad is hesitant at first but he performs for the crowd who give him thumbs up. MC Sher even gets him to shoot a video which becomes very popular. However, Murad is not able to pursue his passion full time. He is compelled to step into his father’s shoes and become a chauffeur after the latter fractures his leg. He also has a complex on account of his social status. What happens next forms the rest of the film. 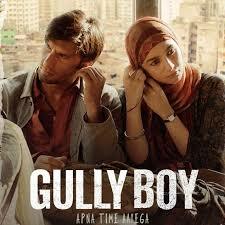 Gully Boy (2019) GULLY BOY is the story of a timid slum dweller whose life changes thanks to his talent. Murad (Ranveer Singh) is a college student who lives in a slum in Mumbai’s Dharavi. He’s in a relationship with the fiery Safeena (Alia Bhatt), a medical student who comes from an orthodox upper caste Muslim family. There’s tension in Murad’s house as his father Shakir (Vijay Raaz) gets a second wife, much to the dismay of his mother Razia (Amruta Subhash). Meanwhile, one day an upcoming rapper MC Sher (Siddhant Chaturvedi) performs in Murad's college and he gets floored. After all, he’s always been interested in rapping. MC Sher one day asks aspiring performers to meet him and Murad jumps at this opportunity. MC Sher takes a liking for Murad and motivates him to rap publicly. Murad is hesitant at first but he performs for the crowd who give him thumbs up. MC Sher even gets him to shoot a video which becomes very popular. However, Murad is not able to pursue his passion full time. He is compelled to step into his father’s shoes and become a chauffeur after the latter fractures his leg. He also has a complex on account of his social status. What happens next forms the rest of the film..
'Kaun Bola, Mujhse Na Ho Payega?' For Those Who Fear To Pursue Their Dreams, Ranveer Singh & Co. In Gully Boy..
My Minor Quibble With This Film Is In The Ways Akhtar Plays Safe: The Father Who Is So Against His Son Coming..
All Said And Done, Gully Boy Is A Once-in-a-blue-moon Film! There Rarely Comes A Film That Perfects Almost..
Gully Boy Starring Ranveer Singh And Alia Bhatt Is The Big Bollywood Release Today. Ranveer And Alia Put Up.. This Film, As Per Its Opening Slate, Is A "shout-out" To Budding Mumbai Stars Naezy (Naved Sheikh) And Divine..
Good Art Takes Us To Places That We Rarely Get A Chance To Experience. In The Nearly Two-and-a-half Hours..
Bollywood Music Holds Sway Over Indian Listeners And This Film Ironically May Help Bring To Mainstream The..
Gully Boy Is Definitely A Landmark Film That Will Shine Bright On Ranveer And Alia’s Eclectic Resumes. This..
Gully Boy In Berlin With Rajeev..
Alia Bhatt & Ranveer Singh Best..
Gully Boy Movie Trailer Launch..